Teresa Dyer is a newly inducted member of the Forever Cash Hall of Fame! In this episode, you’ll learn all about her entrepreneurial journey and how she more than doubled her yearly income. You’ll hear about Teresa’s false starts and failed investments and how, instead of giving up, she learned from those experiences and became a better entrepreneur. Also, you’re going to want to stick around because half way through, an unexpected visitor makes an appearance! For all of you who have preconceived notions about who real estate investors are, prepare to have your mind changed. Jack: Hello. Jack Bosch here with www.landprofitgenerator.com. 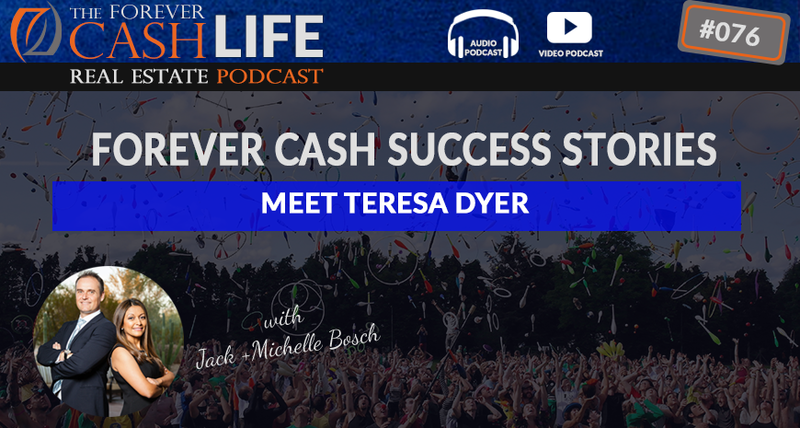 I’m excited to be here again in our podcast series video and audio podcast series of the “Forever Cash” live real estate podcast with Jack and Michelle Bosch. Michelle is not available today so I’m running the show alone. And I have a very special guest today, one of our successful students and somebody that we have just inducted into our land for pennies or Forever Cash Hall of Fame. So we’re going to talk. I’ll introduce her in a second. So we’re gonna talk about her deals, how many deals she’s done, how she did 19 deals in a very, very short time period of like literally six months. And we’re going to talk about, really, how that has changed her, impacted her as a person. So stay tuned. We’re going to start right now. Announcer: Welcome to “The Forever Cash” live real estate investing podcast with your hosts, Jack and Michelle Bosch. Together, let’s uncover the secrets to building true wealth through real estate and living a purpose-driven life. Jack: All right, we are back. And first of all, I want to welcome our guest of honor today, Teresa. Teresa Dyer, and newly inducted Hall of Fame at our last live event which we just did a few weeks ago in Tampa, Florida. And she was one of the chosen two people to be inducted into the Hall of Fame. But first of all, welcome, Teresa. Teresa: Hello. I’m so glad to be here. Thank you, Jack. Jack: Wonderful. I’m so proud of you, man. Proud of what you have accomplished. So first of all, tell us…let’s get started right away. Tell us a little bit about you, where you’re from, your background, your history, and then we’ll go from there. Teresa: Well, I’m originally from New York State but I live in sunny Florida now. My mother when I was young always took us to model homes and I started loving real estate as a kid. So when I moved down to Florida, I decided I wanted to become a real estate investor. And I went ahead and purchased properties that I could use for rentals and I did everything wrong. I managed them improperly, bought them the wrong way and lost them one by one either to foreclosure or selling them at short sales. So I decided that I wanted to get back into real estate, only do it the right way. And so I did a lot of…I went to this RIA meetings in Orlando, and that’s where you were giving a talk, Jack, and it just resonated with me. So I went to the weekend seminar, bought the program, and that was six years ago. So I jokingly say that I did not heed your advice that a man is not a plan. I allowed boyfriends here and there to get in the way. But right now for the past two years actually I’ve been able to really focus on myself and my business. And that’s why now I’m becoming successful because now I’m heeding your advice. Jack: Wonderful. And I have…I always say that when I do a presentation and that we truly believe that that a man is not a plan. Like in real estate is a very male-dominated industry. Like if I go particularly if I go to other meetings, I go to masterminds, even our own mastermind it’s like 80%, 90% men and we are actively looking for more women in our mastermind, The Ultimate Boardroom. But outside of that, even any mastermind that go through, any conference I go to is like 97% men. And I always think like women are just as smart as men, if not smarter, and can do everything men can do and a whole bunch more. So I want to really impress that upon my audience every time. So like to the women in the room a man is not a plan, meaning that you have to be able to do everything as good as a man especially with real estate investing. You can’t financially depend on the man because, I mean, even if you’re happily ever after, stuff could happen. Health problems could happen, challenges could happen that might force you to step in. But at the very least…but even if they don’t happen, it gives it that you should be able to stand on your own feet. And you have basically said you didn’t heed that but you are now and the results are success. So tell us a little bit about…so you obviously you’re doing well. She’s one of our students. Teresa, you’re one of our students. You have been successfully now doing land deals. But let’s jump into the house deals. What do you mean by you have bought them all the wrong way and managed them the wrong way? Sort of expand on that just a little bit. How come? Teresa: Well, I bought them as the market was going up and in the 2000s and when any bank would give anyone a loan. So I really, you know, the rent was maybe $150 more than the mortgage payment. Well, and I realize now that that’s not a big enough spread. Jack: Unless you have other sources of cash flow that can cover that is $150. Yeah, that means you’re losing money every month. Teresa: Exactly. And I did and I’m not a property manager. I’m a server. I’m a waitress. I’d like I’ll bend over backwards for people. So I bent over backwards to let people into my house, houses or rental units, and they trashed them one by one. And because, you know, the money didn’t flow, I was unable to go in there and clean them up for another tenant. So yeah, I lost them one by one. But it was a great learning experience. Jack: Yeah, absolutely. Absolutely. So that totally makes sense. And then the market obviously crashed and as like so many people, all of a sudden, either the properties went vacant or if they keep negative cash flow, and you have to then spend every year every year like three to five grand to fixing them up. That, say, $150 is not a big budget and that’s what most people forget with houses. I mean, I always like to say if you have a house that puts out $500 more in cash flow than the mortgage payment, then you’re probably pulling in $100 to $200 a month in positive cash flow. Those numbers of like, “Oh, I’m making $500 a month,” they’re wrong numbers. They’re just wrong numbers and that’s one of the reasons that my home rental houses that Michelle and I own, we own them free and clear because they’re lower-end houses. They’re like worth $100,000. We got into them for like $55,000. And by the time we’re done, we’re $65,000. And we’re keeping them but we’re keeping in cash because we’re getting $950 in rent. But if we’re lucky, we’re making $500 to $600 a month in net rent if we take everything into consideration. So if I have in the deal $60,000 and I’m making $6,000 a year, I’m getting a 10% return of cash on cash return before any kind of depreciation and tax benefits so I’m end up with a 13% to 15% return, which I’m happy with. But if you don’t…but do we have months where we make no money on these deals because 2 or 3 properties needed the $6,000 rehab? Yeah, that happens. So it’s the single families for retirement is a difficult kind of thing to make work unless you have like some other sources of income. So I’m with you on that. So you abandoned that and then did you jump…so you got my program but you said you got the program six years ago. What happened in between here? Teresa: Just life. Not setting goals. Was setting goals and not looking at them often and planning for them. I think the hardest thing that I’ve had to do in the past couple of years is working on myself so that I can stay positive, stay focused, set goals, set the steps that it will require to achieve the goal and then do the steps starting at one, two, three, you know, until I achieve my goal. And now that I know how to do that, I’m very much more confident. I know I can get where I want to be. Jack: Wonderful. So I’m actually…just when you mentioned that, I’m reading a book right now that seems to be good. That’s really good reviews and it’s called…and starts out good so far. It’s called “The Slight Edge: Turning Simple Disciplines Into Massive Success.” And at the end of the day, I think that resonates a lot because if you look at it, if two people do the same thing but one is like sloppy and the other one is disciplined or then over time they’re just going to separate a little bit, a little bit. So if they’re happy after a month, it looks like they’re both doing the same. But if you look at it after two years, one is like way ahead while the other one is still down here because they’re not doing that. And what is the difference in that? It’s really the internal work of doing certain things a certain way. So, great. So now, let’s let the cat out the bag. So you got started with us when, right really started? I mean, you had the course into a bookshelf as shelf help, but then you got started when? Teresa: Let’s see. 2017 is when I started in earnest. Jack: Okay. And what made you pull that program out of the bookshelf again? Because I kind of have a hunch that you probably had more than one at home. Teresa: Oh, yes, I did have more than one but this one seemed the most doable for me and where I was in my life. Jack: Okay, where were you in that life, if I may ask? Teresa: I guess you could say I tend to be fearful. I’m afraid of the change and your program made the most sense to me. Other programs just didn’t make sense and yours I could relate to and I could see how, yes, I can do this. Jack: Okay, wonderful. So then you got started a little bit. And then after, did you get successful right away? Teresa: …talking to strangers, making offers that you knew they weren’t going to like. And then I eventually did get a deal but it was a very small deal. I started out small but I guess it’s baby steps with me. My first deal was for two lots that were unbuildable because they’re not accessible for the county where they’re in. And so people go out there for recreation, they take their four-wheelers and they have fun out there. So I bought 2 lots $400 each lot. And I paid cash for them because I could do that, and then I advertised them as recreational lots. And I sold each one to the same gentleman for $1,000 apiece. And I thought, “Well, that’s a pretty good return on my investment, 150%. I like that.” But the cool thing about that deal was that we closed at a bar. Jack: Okay, so how did that go down? Was that the place you were [crosstalk 00:11:38]. Teresa: Maybe $100, $200, $300, $400, you know, and then when he was all done counting, and I handed him the deed and that was our deal. I had done the title work because the owner had actually purchased it when the developer first developed that land. So there was only one owner, it was very rather simple for me. But that deal gave me the confidence then to move on to the next deal. Jack: Exactly. Isn’t that like, like, it doesn’t matter if the first deal is big or small? It matters that it happens, right? Jack: Yeah. So that’s what I find that again, and the same obviously happened to us when we did our first deal. We made $3,600 in our first deal but it changed our lives. And then afterwards, at some point of time, you also entered our mentoring program. And then now since then, how many deals have you done? Or tell us a little bit about that. Teresa: Well, in the last year, 2017, my coach asked me, “How many deals have you had?” And I thought, “Oh, gosh, I don’t know.” So I went back and I counted them up. I had 19 deals for total of $70,000. Now for a waitress living paycheck to paycheck, that’s huge. I know that a lot of your students make $70,000 on one deal. But for me, that was huge. And now I’m looking forward to making a $70,000 deal. Jack: Yeah, exactly right. I mean that it doesn’t matter if somebody else makes $70,000, what matters is that $70,000 in addition to your current job while you kept your job, right? You still have your job? Teresa: Yeah, I still have my job. Jack: I don’t know but that is more money than most people make in that industry, right? Jack: So you’re probably more than doubled your income on that and that is super exciting. And $70,000 is a big deal for really everyone. I mean, unless somebody already makes $500,000 a year, it is a big difference. Actually, this story is so inspiring that I actually just looked over here at my shoulder. And Michelle while she was not available for the podcast recording right now, she actually has just done with what she needed to be done and she’s right here. She wants to join us because she is so inspired by the story. Michelle: Hi, Teresa. How are you? Teresa: Michele, I’m great. Thank you. How are you? Michelle: And guys as well, you know, inspiration and you’re really a role model. I mean, anyone can do this and I’m just like very excited that he is starting to interview the ladies in the group as well. So, yeah. Jack: Yeah. It is inspiring for so many people. That’s what I was going for right now that unless somebody already makes half a million dollars then $70,000 doesn’t look so exciting. But most America, American family income is around $50,000, the average American family income. You just created more than that in pretty much a year part-time. And can you imagine what that will lead to if you do this full time? Teresa: I’m excited about it, yes. Very excited. Michelle: And starting to add zeros, you know, to those deals. Teresa: Certainly. I have a story that I had told some of my fellow students over the weekend in Tampa and I’d like to share it with you. Jack: Yeah, absolutely. Go ahead. Teresa: I shop Walmart when I get out of work at night. That’s when I pick up my groceries. And I had just closed on a few deals and I was walking through Walmart when it dawned on me, “Oh my God, I’m not living paycheck to paycheck anymore.” And it was such a humbling experience and I was just honored and amazed. And I thought to myself, “I can buy a gallon of milk for my son.” And then I thought, “No, wait a minute, I’m thinking of him guzzling milk. I’ll buy two gallons of milk.” That was exciting to me. That was my aha moment. Michelle: Having to decide. It’s like money decisions from the moment we wake up, you know, do we run the shower an extra three minutes for water? Do we keep this light on? It’s always economic decisions every day from the moment you wake up to the moment you fall asleep. And then you start having success in this business and a lot of those things that were at the forefront are no longer at the forefront, rather a big vision of what you can accomplish takes its place instead and it’s fantastic. I know exactly what you feel. I mean, we go either grocery shopping or sometimes we go to a store and I don’t no longer go to the sale rack. I’m like, “Oh, I like this.” What’s out there on the window, I can go for it. And I don’t have to look at the price and it’s just incredible. Jack: And while we’re frugal in a sense that we don’t spend frivolously, it is a beautiful feeling to know that you can buy two gallons of milk or you can buy the groceries you truly want. The organic groceries or whatever is really is important to you or try this $5 kind of shake and so on that before looked like crazy and just like, “Let’s just try it. Let’s see how it is.” And because you know you no longer have to choose between one or the other, you can actually buy this and you still have money in the bank. Teresa: Yes, it’s a wonderful feeling. Thank you. Jack: You’re very welcome. Thank you for actually making it happen because the book and the course on the bookshelf will never jump off the bookshelf and implement itself. It was you who implemented it. And yes, we all perhaps a little bit but it was you who implemented it and so you can be proud of yourself. So I’m very excited about that. Michelle: Teresa, I don’t know if Jack already asked this, but were there moments where you were like super scared and you mustered the courage to get over that fear and go out there and do something? You know, was there a specific example that comes to mind at the beginning or even still today? Anything where there’s an hesitation? Teresa: The first deal that I did where I was assigning a contract. I was very nervous about that. Fortunately, I was assigning it to a builder who understands how all that works. So I didn’t have the buyer questioning what I was doing. But once I went through that with him, then I was able to assign contracts to people in the general public and I was able to explain it better to them. And most of them understood. One gentleman did not and he called me a fraud and cussed me out. And, all right. Goodbye. Jack: Exactly. Then a buyer came along and you made money, probably even more money. Jack: There we go and that’s the attitude. I read a book about that that basically that changed my attitude about this. And that’s exactly towards your point, that’s like if, let’s say, for every 10 doors somebody knocks on they get 1 yes. So the goal becomes not to get more yeses, the goal becomes to get more nos. Because you know with every no, you’re closer to one yes. So if you know you got 20 noes in a row, you should be getting two yeses very soon and you get yourself excited about getting the nos. And I thought that there’s such a different ways because instead of the noes dragging us down, this is actually noes pushing us up and helping us move forward. So I like that what you just said a lot. Great. So tell us a little bit about your vision of what…like other than you said you wanted to become a real estate investor, but what was behind that? Was it just like on a whim you woke up because your parents brought you to open houses? Or is it like something deeper that wanted you to become a real estate investor? Teresa: It’s definitely deeper. I had gone to the Millionaire Mindset Seminar and they make you really figure out the why. There’s a why behind it. Yes, I want to become wealthy but not so that I can have an airplane and a fancy boat and a big house. It’s the closest you can come to buying time with your loved ones and to really experience life the way that God wants us to experience life. And I learned too that how can I help anyone else if I’m poor? The only way you can help others is by being wealthy. Once you get money out of the way, you can help others. And I knew that real estate investing was a great vehicle to get me to where I wanted to be. So now I’m looking forward to, you know, increasing the zeros in my income and having forever cash, so that I can get money behind me and start really living. Jack: Then really that’s probably a good reason why you’re successful is because you got your priorities in a way that they really resonate very, very closely with your core and how you want to live life. Because if you just chase money, yeah, you can make money but you’ll never be fulfilled. So if money is a tool for a bigger purpose, and I 100% agree with you on that. Michelle: May I ask, Teresa, how old is your son? Teresa: My son is 30, and I have a daughter 35. Michelle: Are you a grandmother? Teresa: Yes, I have a grandson. Michelle: Oh, my goodness. Yeah. Jack: Isn’t it funny that what I find is that once you show the success to the family and it’s a prolonged success, it’s not just one deal but more deals, all of a sudden they’re like often families goes just like…I don’t know if that was the case with you but I see that often. The family first says like, “Well, you do that.” And they don’t want to see you fail, but they want you to like, “Let’s see if this actually works.” And then once you’ve proven the concept, and you’ve proven the process, and you’re showing to them like, “Oh, my God, she’s making more there than she’s making in the job. Can you tell me how this works?” And then now they become interested. So that is probably also very smart that you…I don’t know if you tried right at the beginning to get them in, but it’s very smart that you did it first yourself to show the proof because then they come on their own. Because often, I can already tell with our 11-year-old. If we want her to do something, she wants to do the opposite. Teresa: Oh, yeah. That’s the way they are. You got to love them. Michelle: Let me pull up a chair. Jack: Right. Go ahead. I offered you my lap earlier. But you have a bunch of things here, so, wonderful. And I have my co-host back. I’m super excited. So you also told me that you read our book, right? The “Forever Cash” book and that makes a difference for you. Can you talking a little bit about that? What did you like about that one? Teresa: Well, I understood that real estate was a vehicle that could get me to where I wanted to be. But when I read your book after I had purchased the course, then I realized, “Oh, I wait tables. I do the land flipping on the side, and that will get me to where I want to be in real estate.” It just brought the whole picture together for me at just the right time in my life. It was perfect. Jack: So now what’s the goals for the future? Teresa: The goals for the future, well, right now, I have Mike Mackenzie as my coach and I want to add zeros to my deals. I want to get into the larger deals because I’m very comfortable with these little deals but it’s time to move on, you know. That I really look forward to. And of course, honestly, I feel as though as you move up, you bring us up with you. And the apartment complexes sound very interesting to me. I would like to be able to invest in that in the future. Teresa: And also, yeah, I don’t know if I want to do rentals. I’m not sure at this point. Teresa: It’s superior, yeah. You’re looking at a hundred doors at a time versus one door, you know. Jack: Superior to single family investing. So we still have a lot of single families and we’ll probably keep them, but we have switched over from buying more single families to buying more multi-families, because there’s a professional company you hire to manage them. And I have professional companies to hire single families too but you get staff on there. So it’s a transition from our personal investment. But what allows us to actually invest into these apartment complexes, it’s the land, just like you said. It’s the lands that does that. Very nice. Go ahead, please. Teresa: Well, I feel as though I would probably need to purchase some duplexes, triplexes, that kind of thing in order to set up forever cash and have property managers manage it properly and so that I’m a little more hands off, because we see what happens when I’m hands-on, and that is a regret. I just feel that I will end up rental properties. Teresa: But I’m not going to rush into it, yeah. Jack: Yeah. So I think you’re also, just to your defense, you got into the rental property market at the wrong time when everyone else got in the wrong time and everyone lost money on there. So, I think the lesson learned from that is timing it is a big role. If you want to get into improved property, not on the land side, timing plays a little bit of a role because right now, we have an absolutely amazing market. But people…but we and our students were still doing deals when the market was way low. So you can make do-deals in every market but we proved in that rental properties market, timing is even 10 times more important because if you buy at the peak of the market, then the cash flow is just not there because you can’t just charge three times rent for your apartment, or for your house. The rent is what rent is in the neighborhood and the values are just going up and down over time. So what I suggest you probably want to do is keep your blinders on right now, do another 100 land deals at not $4,000 a deal, but at $10,000, $20,000, $30,000 a deal. Now all of a sudden, you’re sitting on hundreds of thousands of dollars in cash. Then you use that and buy yourself some forever cash, that then whenever you’re ready to retire, pays for your expenses for the rest of your life. Jack: All right. Wonderful. Great. So that was awesome. So do you have anything onto that? Teresa: I was going to say too that at your seminar with the IRA club, that was very exciting to me because I am over 59 and a half. So a lot of my deals I can do in an IRA, I recognize the fact that I won’t be able to pull the money out for about five years. Jack: No, actually not true. If you have a self-directed Roth IRA, and you’re 59 and a half, you can pull the profits out the next day. Teresa: Oh, really? Okay, that’s really more exciting. Michelle: It’s the perfect crime. Jack: It’s the perfect thing. Now, there are some, I think this is not legal advice, you need to check with your CPA and so on of what ratio of deals you’re doing there. This not because there are some IRS rules, but they’re very, very wishy-washy. Very, very gray. There’s no clear guidance of what is considered doing a business in your IRA, which would trigger extra taxes and what is considered investing through your IRA. So I don’t want to say anything on that lines. Just check with your CPA and get that guidance of what they think what’s your CPA thinks is safe, and what is not safe. But you can definitely do several deals a year and be on the safe side if you do it the right way, particularly if you do a lot of deals. If you just do a few in your IRA, and you do your biggest ones in the IRA, all of a sudden that money is tax-free and comes right out. And that’s a perfect scenario. Teresa: Sounds great. And that’s what I would like to tell all of your listeners whoever watches this that your program is wonderful but you provide so much more than just how to flip land. You make us think about goals and think about our why. And then, you know, you offer all these other side thing, the IRA and thinking about our future. And I appreciate what you do very, very much. You guys are great. Jack: Thank you very much and we appreciate you taking action. You’re making us proud and you’re being one of our future millionaires, because everyone perhaps hopefully knows, we are on a mission to create 1,000 millionaires out there. And Teresa Dyer is one of our future mentoring millionaires. I can’t wait for you to let us know that you hit the million dollar profit margin. Which at your speed, it will probably not take you more than a year or so. Teresa: Thank you. Good. That fits my goals. Jack: There we go. Wonderful. So with that, thank you very much for being on the call. Do you have any kind of like perhaps last words about…of encouragement like based on your experience? Or, Michelle, go ahead. Michelle: Yeah, I would say like what are your three top, you know, pieces of advice of something that you know now but that you wish you would have known earlier? Teresa: Just don’t ever give up. Jack: Thank you very much and I’m super proud of you, and we’re super excited. Can’t wait for your future success. And with that, thank you very much. Bye-bye. Announcer: Enjoy this episode, then make sure you like, subscribe, and post your comments and questions below the video. We’re looking forward to hearing from you.